This Outstanding Oceanfront home is situated in the heart of the Beach & is convenient to area attractions, including the Wright Brother's National Monument, fine dining & shopping. Spacious & very well appointed w/ all the Amenities to Ensure your Family will be Pampered. This home is a Duplex & both sides are mirror images of each other & have a connecting door in the Upstairs Living Area that can be unlocked to make this a Ten-Bedroom vacation home. Both sides have their own Hot Tub & Share a Large Oceanfront Swimming Pool. Full Access to the Outer Banks YMCA is Provided at No Extra Charge. Includes Indoor & Outdoor Swimming Pool, Full-Court Gymnasium, Free Weights, Group Fitness Classes, Skateboard Park, & Much More! Ground Level: Parking for 4 Cars, Covered Entry, 1 Bedroom w/2 Daybeds, 1 Roll-a-Way, 1 Full Bath, & Laundry Area,Semi-Private Swimming Pool, Basketball Hoop, Enclosed Outside Shower, & Picnic/Grill Area. Mid Level: 3 Bedrooms (2 w/Queens, 1 w/2 Singles, & 1 Trundle), 2 Full Baths, & Covered Deck w/Hot Tub. Top Level: Living/Dining/Kitchen Areas, Flat Screen TV, Bedroom w/Queen & Full Bath, Sun Deck, Deck Furniture, & Great Ocean Views. Features Include: C/AC & Heat, Washer, Dryer, Dishwasher, Microwave, 3 TVs, 2 VCRs, Wireless Internet, Stereo w/CD, Phone w/Answering Machine, Ipod Docking Station, Pool & Deck Furniture. No Pets. This is a Non-Smoking Unit. 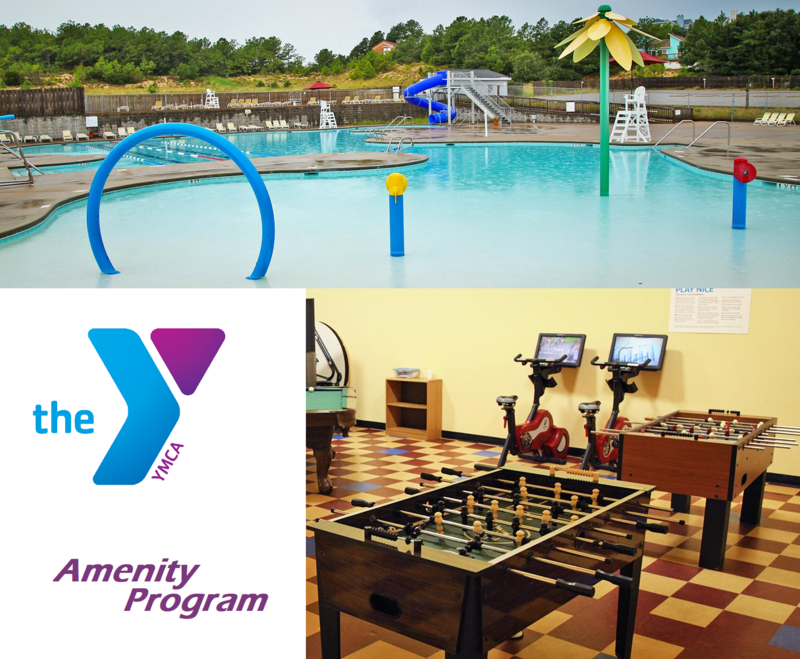 To See more about the YMCA and the amenities it provides visit their information page. Great house with excellent view, cozy furniture and well stocked kitchen. The house was incredibly well appointed and honestly much nicer than we expected - the pictures on the website really don't do it justice. We loved having the opportunity to share the house with friends, who had the other side of the duplex, but still having our own spaces to retreat to. Thanks for sharing this vacation home with us! Great house to share with family members. 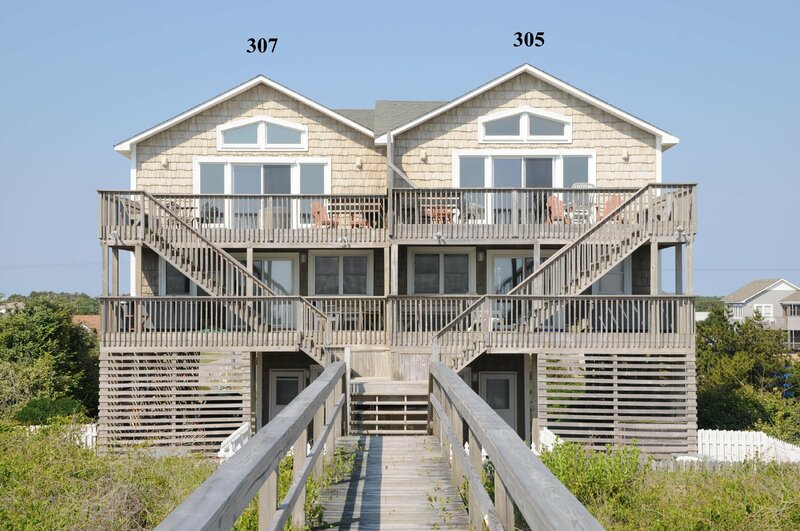 Renting both sides makes a 10 bedroom with great access and accommodations.